I am 15 years old and two days ago, after getting out of the shower, I realized while looking in the mirror, a small cluster of almost pimple-like bumps stretching across my hair line. I began to get a little upset, considering I am a model, that the skin rash was acne and/or would leave scars after healing. I used my normal face wash and gently scrubbed my entire face. Afterwards, I began to observe the rash again and I noticed that where the rash was a small piece of skin had rubbed right off! I tried to ignore it, took some Benadryl, and went to bed to see if it would clear up in the morning. When I woke up the next day, my face looked and felt no different, except where the skin was missing it looked really red and sore, and sort of glossy. I decided that it would be fine and got ready for school as normal. On the way to school I was applying makeup in the mirror when I noticed the skin rash had spread down my face and all the way down the right side of my neck. Thinking that the rash was a severe allergic reaction, I stayed home and contacted a local doctor. I got an appointment for the next day and by then the skin rash had spread all across my face, behind my ears, in my hair line and scalp, and all the way down my back. This skin rash problem has happened over the course of three days. The rash kind of itches and it is itchier on my back and behind my ears than anywhere else on my body. 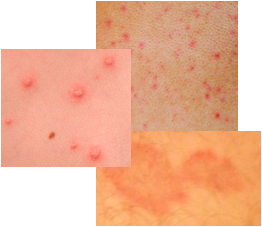 It is slightly painful to touch and small sections of skin may peel off in the areas surrounding the rash. I have also noticed a slight stomach ache, burning eyes and eyelids, headache, and weakness in my legs and arms, as some other symptoms that seem to have appeared with the skin rash. The only thing I have done recently out of the ordinary is use a hot tub at a hot tub party, but I did shower before and after being in it, and I have also contacted friends who were there and no one else appears to have the same signs or symptoms. I have also stayed at a friend’s house whose pets have just been diagnosed with a massive flea infestation and I did have a few flea bites on my arms and legs. Could this have anything to do with it? I have the same problem. I found one flea on my toe and I am starting to wonder if the neighbourhood cat my son has had in my home started this and if I am allergic to fleas. I had this happen to me several times before in my life and doctors couldn't figure it out. They just gave me steroids as a treatment. I did have pets back then. The last time my face and neck did this was when my roommate had a cat and so I think fleas just may be the problem. I wouldn't have thought of it if I hadn't seen that one pesky flea. No more visits from the neighbours cat will be allowed!